16 Pages, 6 5/8" x 10 1/4"
How to stop cyberbullying, and more! Click to see larger versions. 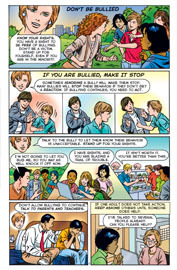 Bridging The Gap provides an easy and effective anti-bullying educational comic book lesson. This self-contained teaching aid is a complete tool for teaching bullying prevention. Children read and reread the comic books at their own pace, to better absorb lessons. You can use these in classroom settings, for school assemblies, or at community group meetings. You can also distribute them freely, for independent learning! Bridging The Gap is ideal for use by Principals, Teachers, School Boards, Guidance Counselors, Bullying Prevention Educators, and other education professionals.